Almost six centuries after the sacking and complete destruction of Carthage by the legions of Rome, it is now the turn of Rome’s soldiers to run for their lives, the Vandal war dogs snapping at their heels, chasing the few survivors to their boats and safety back in Rome, north Africa abandoned. But safety can be only temporary. In the mid 5th century AD, the empire is shrinking, the troops withdrawn from Britain to protect Rome’s core, beset as it is by tribes invigorated by their increasing success. Now, though, there comes an even greater threat, one so feared that one of Rome’s greatest enemies, the Visigoths, considers joining its forces to those of Rome – Attila King of the Huns and his face scarred warriors are on the move. Despite the great threats facing Rome, possibly because of it, this is a time of heroes. Aetius is the Commander in Chief of Rome’s western forces, a man who inspires hope. His nephew Flavius is one of the bravest soldiers, rising through the ranks over several years of campaigns, taking the war against Attila across Europe and right into the Hun heartland itself. Flavius is a fictional character but he is the perfect medium through which David Gibbins explores this crucial and fascinating period of Rome’s last battle for survival in the west. Beginning with Flavius’s military baptism in the collapse of Carthage, The Sword of Attila follows Flavius’s career back in Rome, and in the East, culminating in the great Battle of the Catalaunian Plains against Attila the Hun, which took place in AD 451 in Gaul. The novel presents plenty of action – war dominates Flavius’s life. His military education is spent in Rome, surrounded by memorials to a glorious past, especially Trajan’s Column. Flavius memorises its images and scenes while training future legions to defend the city. But Gibbins also takes us away from the battlefield into the murky world of late Roman politics. This is an empire in decline, ruled by men who epitomise its degeneration. It takes more than a steady sword arm to survive in these times. Even one that hankers to wield the sword of Attila itself. There is another element to The Sword of Attila that adds to its appeal even more than the monster on the horizon, Attila. And that is Arturus, a warrior monk from Britain. Arturus and Flavius endure several adventures together, taking them beyond the fringes of the Dark Ages, into the lawless swamps of the Danube, haunted by memories of an abandoned Britain, keen to return and defend it. Arturus is a strongly believable interpretation of a figure so integral to Dark Ages myth and he and Flavius make fine companions through this exciting journey. 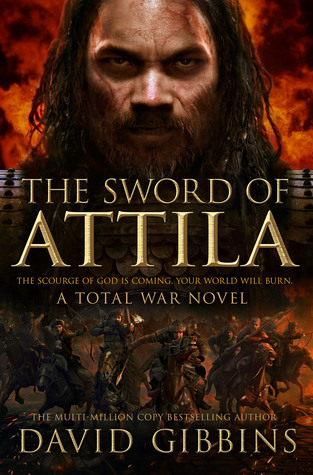 The Sword of Attila is intended to complement the game Total War: Rome just as its predecessor Destroy Carthage did. It is designed to appeal to gamers, introducing the key players and terrain, assessing strategies, strengths, weaknesses and battle plans. The Sword of Attila makes a series of leaps through time, taking us straight to the heart of a new phase of action each time. The emphasis is on the movement of war, the determination and skills of its soldiers. The degenerate rulers of Rome stand in clear contrast to soldiers, including those who fight against Rome. Even Attila is shown to have more saving graces than the eunuchs who corrupt Rome from the inside. I had misgivings about Destroy Carthage. I found it cold and stage-managed. In The Sword of Attila, however, David Gibbins manages to avoid all of the pitfalls of its predecessor, producing instead a hugely entertaining novel, thoroughly researched and vividly characterised. Here are people I enjoyed, hailing as they do from all parts of the known world, the fictional, the semi-fictional and the factual figures all complementing each other perfectly. From the bloody retreat from Carthage through to the final pitched battle, I was glued to the pages of this book. The locations are painted beautifully and the novel moves along with such a pace, teaching us about 5th-century warfare but never at the expense of entertainment and fascinating stories. The novel itself is relatively short at under 300 pages but it is supported by extensive notes, providing background on the history and warfare of the period. I have been such a fan of David Gibbins’ writing for years and I was delighted to discover here an extremely exciting and meticulous account of almost twenty years of military campaigning, focusing on a small group of men, including an enigmatic figure from Britain, who risk everything. Gibbins covers a huge amount of ground but he does so with a great deal of skill, bringing much more than military history to life. This book addresses and fixes my misgivings with Destroy Carthage and Gibbins is to be congratulated. This entry was posted in Historical Fiction, Review, Roman and tagged Historical fiction, Rome on January 27, 2015 by Kate (For Winter Nights).